Here’s a scene you won’t see these days. No Hi-Vi jackets and not a lot of attention to Health and Safety, although there is a solitary cone. The date is around 1965. You can see the new Radcliffe School at the end of Aylesbury Street. This section is between Cambridge and Windsor Streets and you can see Smith’s Corner Shop. Today the crew patching the road would come with a lorry and a roller and complete the operation in about half an hour. 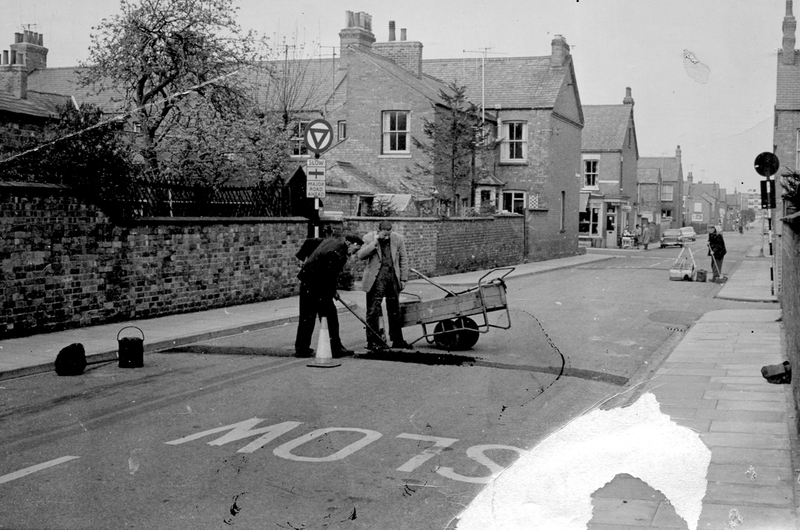 here the men have brought a hand cart with their tarmac and implements and are filling the patch and raking it level. The chap on the right has a heavy roller, which I think was motorized, to pack down the tarmac. I think that was newish at the time, because I used to see a huge diesel-powered roller (called a “steam roller”) do these jobs. Note also the outdated road signs – “Slow, Major Road Ahead” relating to a slower, less complex age, when you actually had time to read the signs. The counterpart to this was “Stop, Major Road Ahead”, found at all the junctions on the Stratford Road. The three men were all regular employees of the council. Their jobs would vary from the sort of maintenance work you see here, to road sweeping (by hand) and dustbin collection.